As National Burger Month comes to a close, we reflect on our burger options. 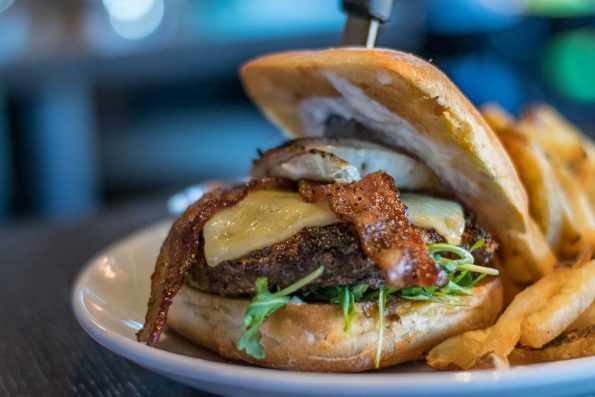 We live so close to some very good burger-centric restaurants like OHSO and Four Peaks, that we tend to forget that other places have some pretty darn good burgers as well. Among those restaurants, is Thirsty Lion Gastropub and Grill. Often left out of our dinner making decisions due to not being in our immediate vicinity, we decide to head over (we made the haul to try out their new Gilbert location in SanTan Village) and see if they could make it to the forefront of our mind when it came to burger options. We started out with a couple cocktails (they have a great beer list as well including Boddingtons on tap!). We ordered The Big Easy (Bulleit Rye, sweet vermouth, absinthe, Fee Brother’s Orange Bitters, Angostura and Peychaud’s Bitters) and The Devereaux (Bulleit Bourbon, St. Germain, lemon juice, sparkling wine and simple syrup). Both drinks were very good and while the cocktail program is accessible (no scary or over the top ingredients), it still feels satisfying. For someone just starting to explore craft cocktails or even a craft cocktail veteran, there is a cocktail for you. 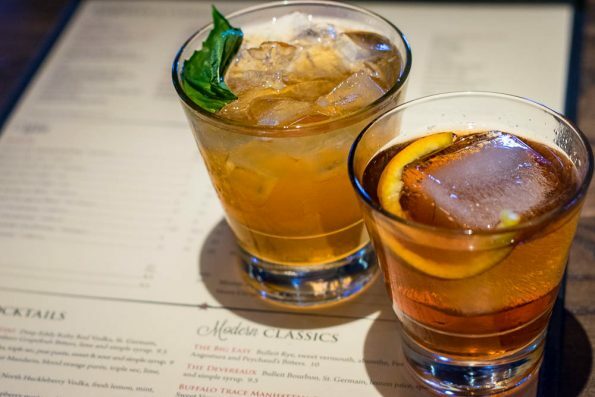 Recently, Thirsty Lion Gastropub and Grill underwent some changes to their cocktail program including fresh squeezed juices and significantly more training, this definitely shows! 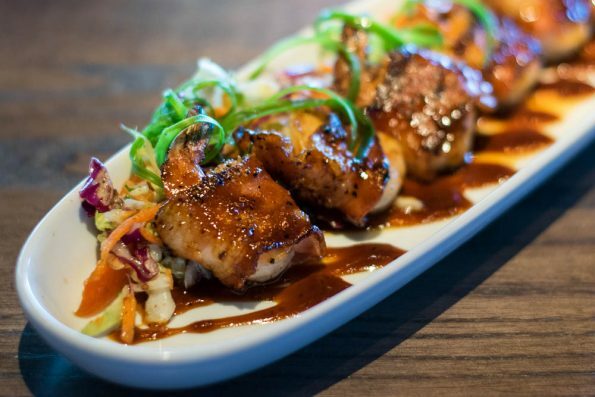 Always open for a pre-meal nosh, at the suggestion of our server Dakota we tried the Bacon Wrapped BBQ Prawns (served with Newcastle BBQ sauce, Napa slaw and grain mustard vinaigrette). As a Thirsty Lion Gastropub and Grill Signature Item (as notated on the menu), we had somewhat high expectations for these and were not disappointed! Man, that bbq sauce was tasty, especially beside the acidic slaw it is served with! 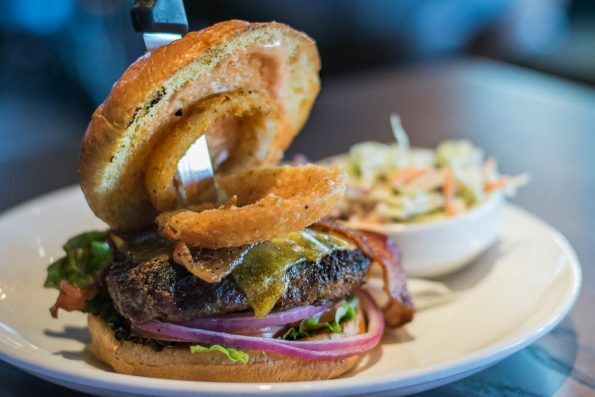 That coupled with crispy bacon and well cooked prawns and you have an appetizer that is just the right size to eat before digging in to some monster burgers! Now for what we really came for, the burgers! We ordered the NW Pub Burger (gorgonzola infused burger with grilled sweet onion, maple pepper bacon, white cheddar, arugula and horseradish cream; also a Thirsty Lion Gastropub and Grill Signature item) with fries and the Tavern Burger (pepper bacon, cheddar cheese, beer battered onion rings, served with pickles and burger sauce) with Napa slaw. We were shocked when the burgers were delivered to our table! The presentation was fantastic! Once we got past how cool they looked, we dug in! The burgers were cooked to the correct temperature (a huge pet peeve of ours) and were seasoned well throughout, not just on top. The maple pepper bacon on the NW Pub Burger blew our minds! Think spicy candied bacon! We basically ate in silence because we were too busy enjoying the burgers to discuss them! The fries were that perfect combination of not too thin or too thick and crispy (also another huge pet peeve). The Napa slaw was just that, we recommend skipping the slaw and going straight for the fries. Our overall experience at Thirsty Lion Gastropub and Grill was one for the books. It is definitely not a place to overlook if you are looking for a tasty burger. National Burger Month may be coming to a close but with the Thirsty Lion around, you can celebrate all year! Where are some of your favorite places to grab a burger? Why? Let us know in the comments below or use the hash tag #GeekEats! Thirsty Lion Gastropub and Grill is located at 2212 E Williams Field Rd in Gilbert, 2000 East Rio Salado Parkway, Suite 1041 in Tempe and 7014 E Camelback Road, Suite 1423 in Scottsdale.